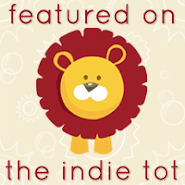 Okay, you might say, "What is so new about Pineapple Upside Down Cake?" Monday is Pineapple Upside Down Cake day. It is my brother, Brian's, favorite cake and it happens to be his birthday! There are a two common ways to make this cake; by scratch or by the box. I have made this recipe both ways. Today I am going to cheat and do it by the box, but I am going to give you some new steps you might not have thought of. Don't worry, I will include a recipe to make the yellow cake by scratch. Lets get stated. When you go to mix the boxed yellow cake together, substitute a portion of the water with some of the pineapple juice from the canned pineapple. My boxed cake required 1 1/3 cup of water and substituted the 1/3 portion for the pineapple juice. Too much juice and it will change the recipe. I also add a teaspoon of vanilla extract just for a little push. I also use a professional cake baking pan. They are taller than the average baking dish on the general market and think this cake looks better fuller. Place the butter in the baking pan and place t in the oven to melt. When the butter has melted take it out of the oven and this is when you have to work quickly, so the butter doesn't cool and congeal. 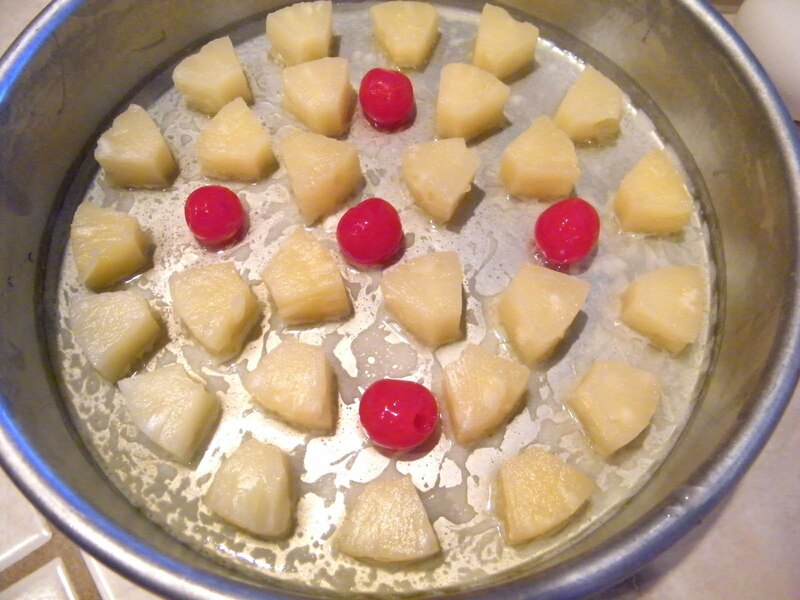 Place the pineapple chunks in a nice pattern along with the cherries. I don't put too many cherries on the cake, which think can be overwhelming. 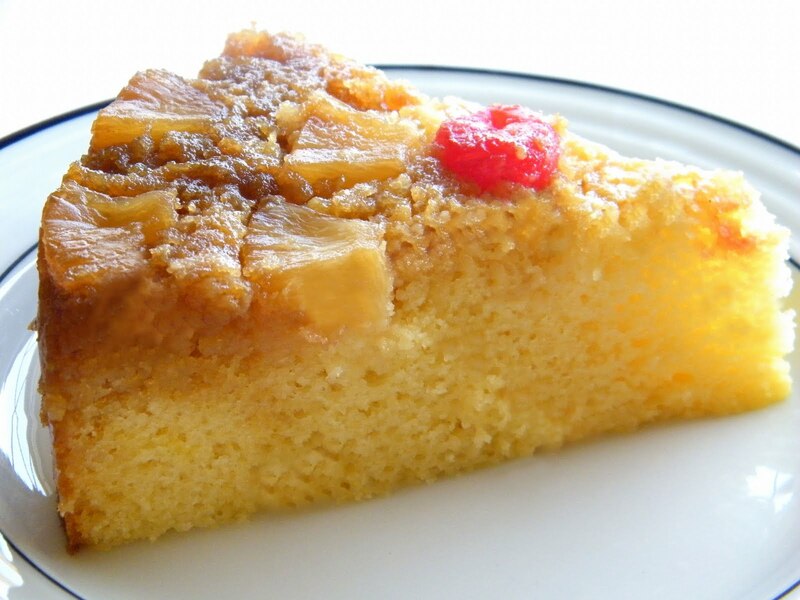 Most versions of this cake use pineapple rings or crushed pineapple. I don't use either. 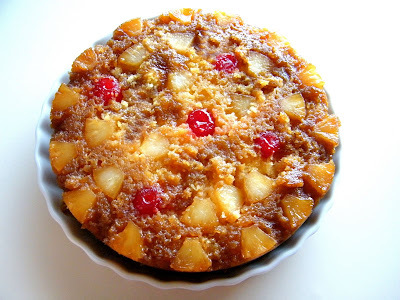 It is harder to cut through the rings when serving the cake and they usually slide off the cake leaving other pieces without any pineapple and I think the crushed pineapple has too much liquid in it to give a chance for the brown sugar to settle. With the chunks you can slice through the cake without issues and each piece you slice has pineapple in manageable bites. Place a ring of the parchment paper around the sides of the pan. This Helps to slide the cake out when it comes time to flip the cake over. Sprinkle a good amount of brown sugar over the entire cake pressing down the brown sugar around the edges and through out the cake. This will help to secure a solid cake top. 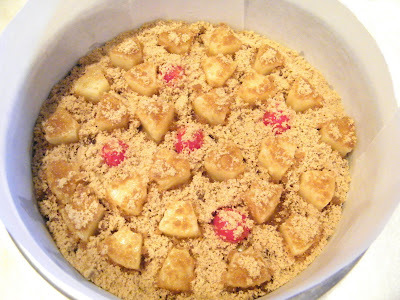 Pour in the entire cake mix over the pineapple brown sugar mix and place in the oven to bake for 40 minutes. If after 40 minutes the top of the cake is still wobbly and the toothpick test comes out wet cook for 5 more minutes and then turn the oven off and leave the pan in the oven for another 10 to 15 minutes. The heat will continue to bake the wet part of the cake without burning the rest of the cake. 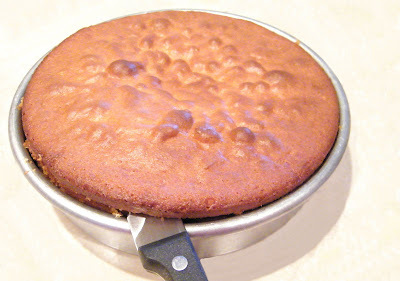 If you use the smaller baking pans then half the cake mix between both pans and cook for 30 to 35 minutes. After the cake has finished baking and cooled enough I still like to slice the top off the cake for an even bottom layer. This cake didn't necessary need a cutting, but it certainly helps in the flipping process. This cake doesn't always land perfectly on the plate without falling apart, but man is it worth the process!